Prepare ye for the timeless tale of friendship, loyalty and love in a masterful retelling of the original sensation with dazzling new arrangements and contemporary references. 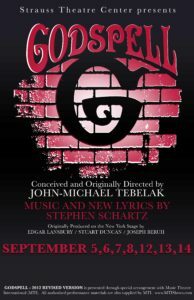 Godspell,2012 Revised Version, featuring songs by Stephen Schwartz, (known for the Broadway hits WICKED and PIPPIN), uses song, dance and storytelling to retell the passion story and parables of the gospels. Filled with high spirited musical styles ranging from pop to vaudeville, this theatrical celebration is a reminder that kindness, tolerance, and love should live on vibrantly.